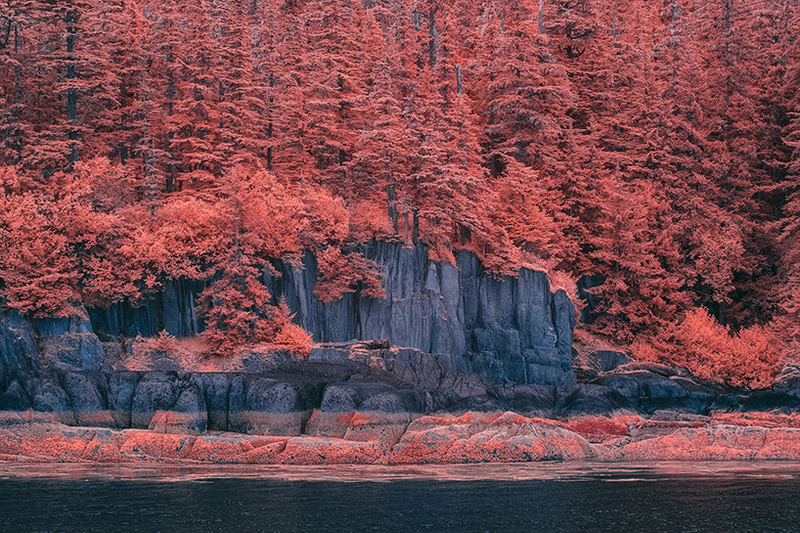 in the summer of 2016, visual and design director bradley g. munkowitz — also known as GMUNK — travelled along the pacific coast of the united states on a journey of inspiration, wandering up the continent as far north as he could. 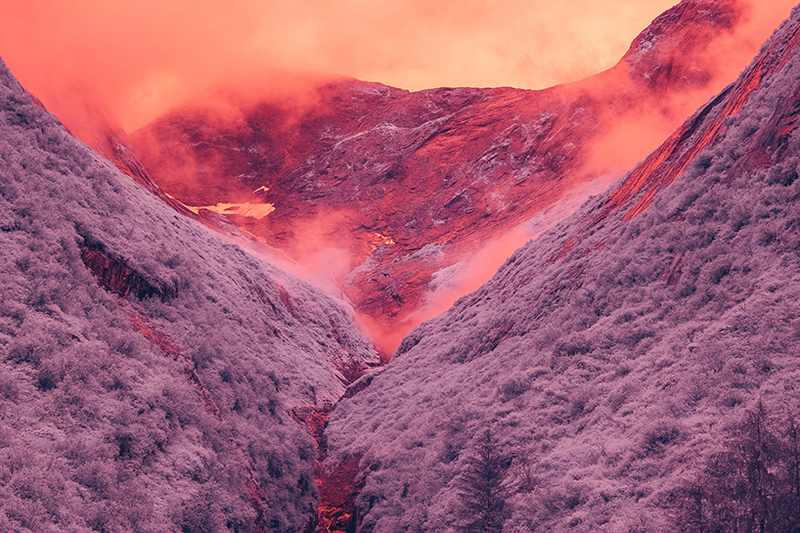 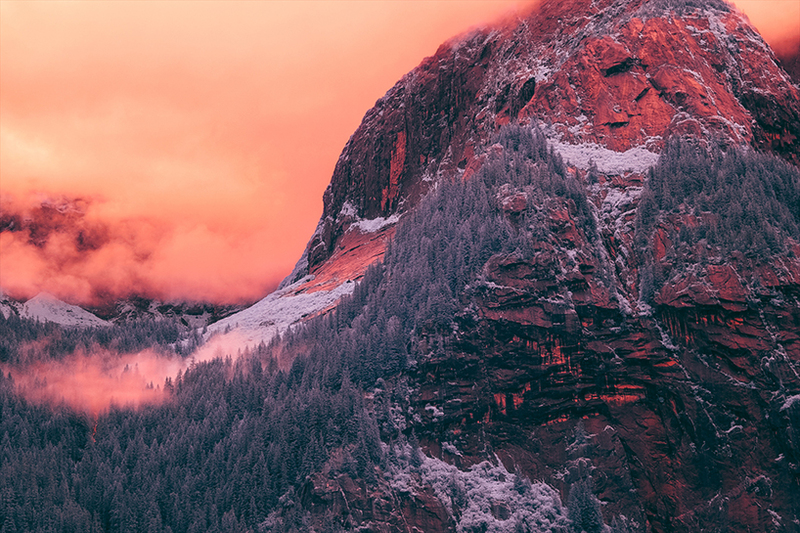 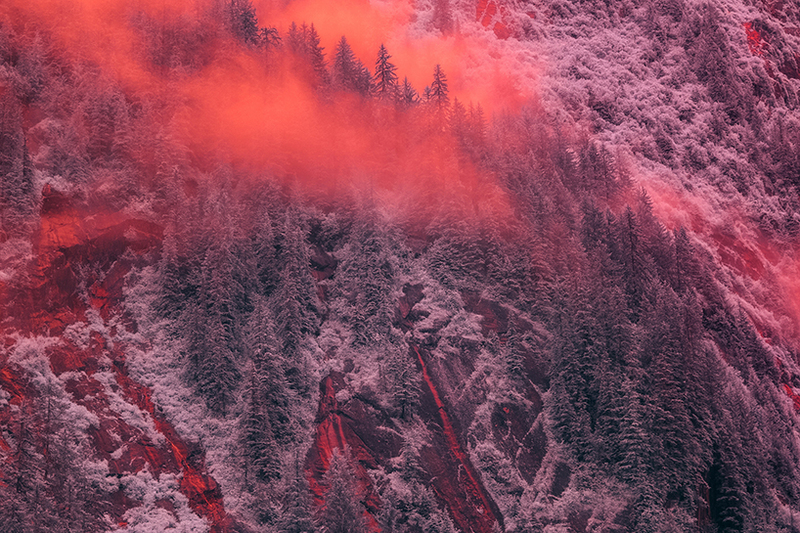 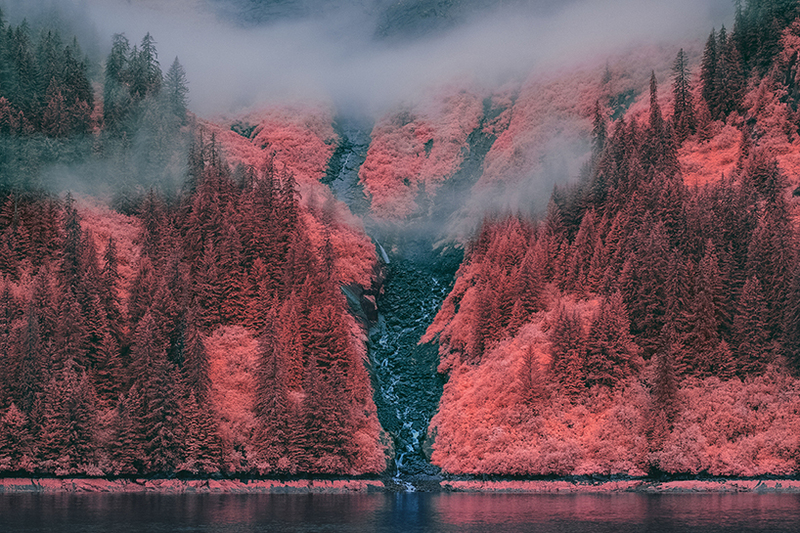 equipped with a custom modified full-spectrum fujifilm X-T1 IR, a grip of lifepixel super-color infrared filters and a vintage nikon manual focus lenses, munkowitz’s documentation of the trip paints the landscape in an alien hue, highlighting the other-worldly beauty of the natural environment. 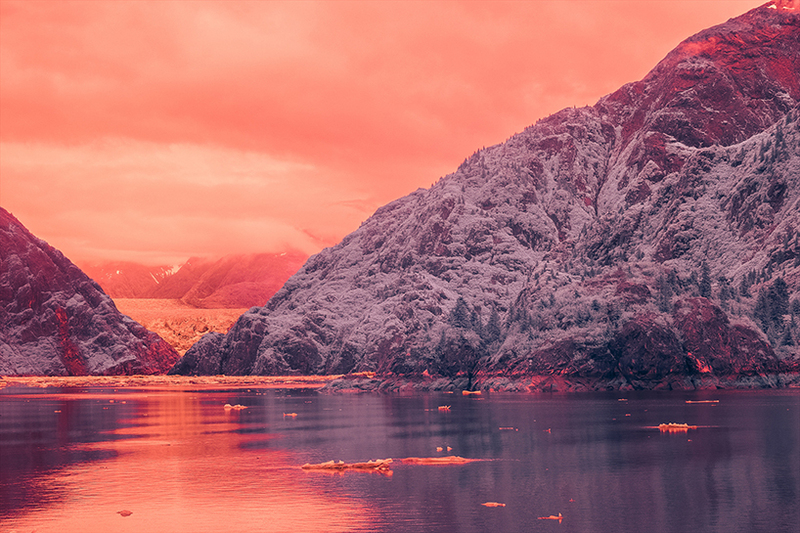 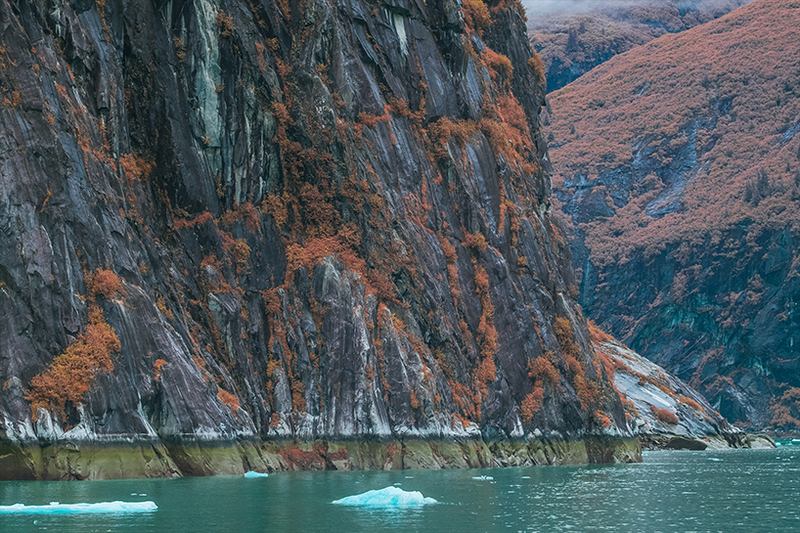 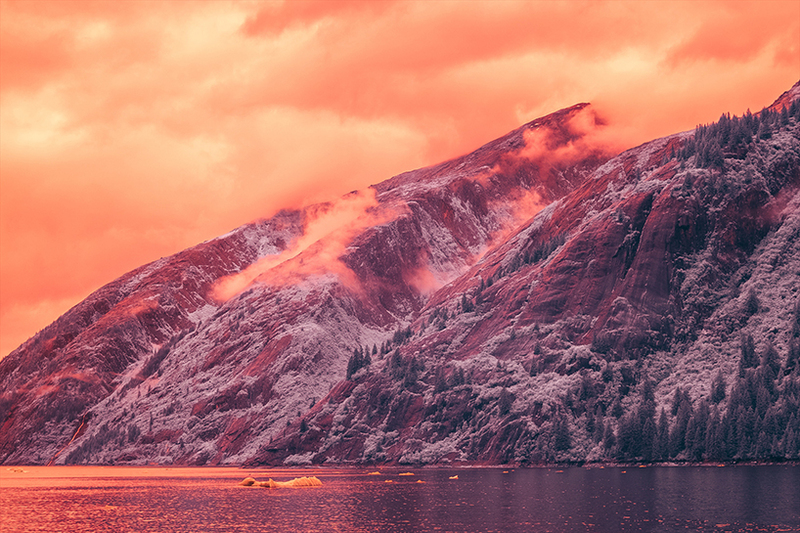 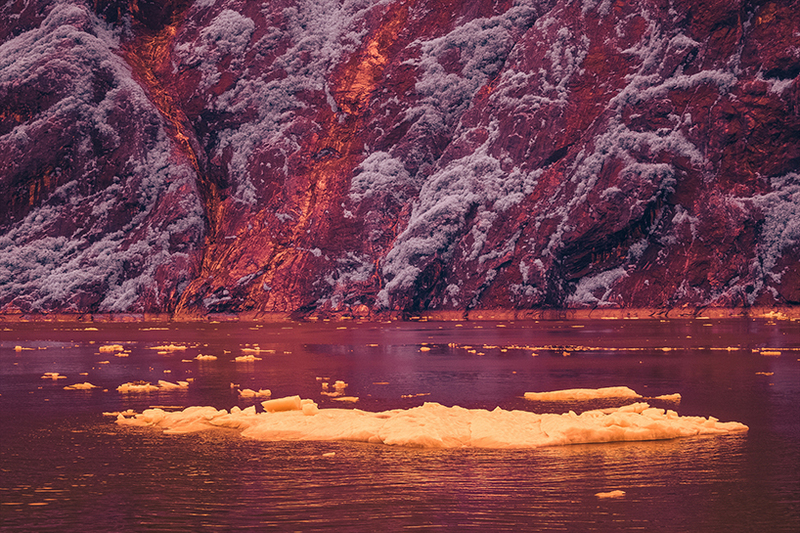 entitled ‘inframunk vs tracy arm fjord’, the series was shot in alaska’s fjord of the same name. 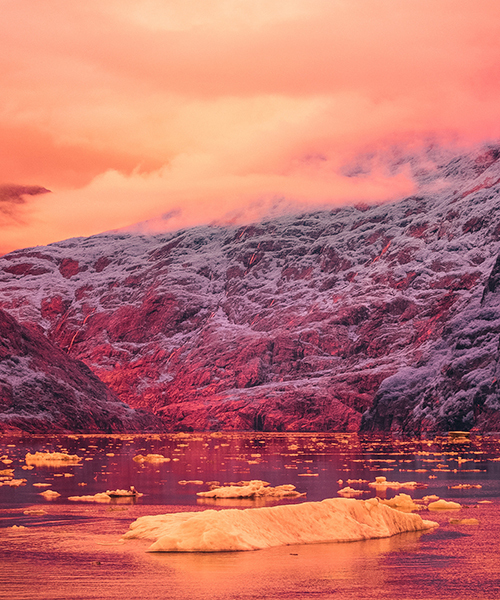 called after navy secretary benjamin franklin tracy, the fjord is over 30 miles long and over a fifth of it is covered in ice. 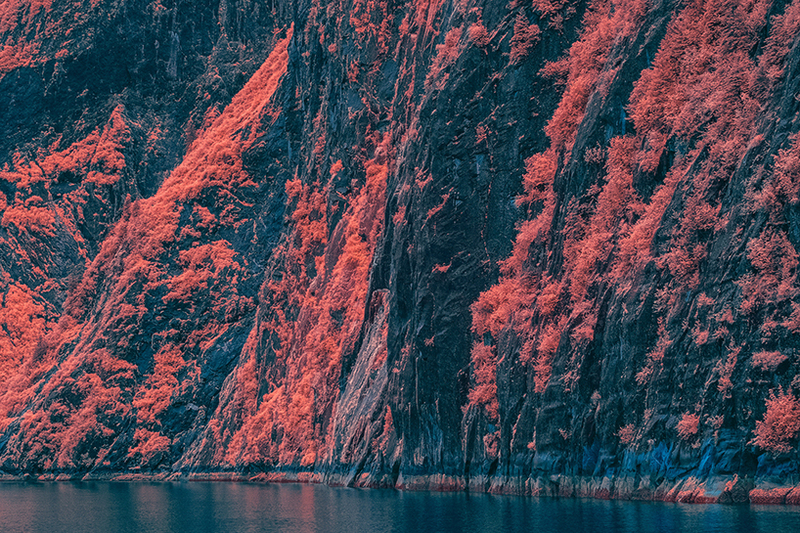 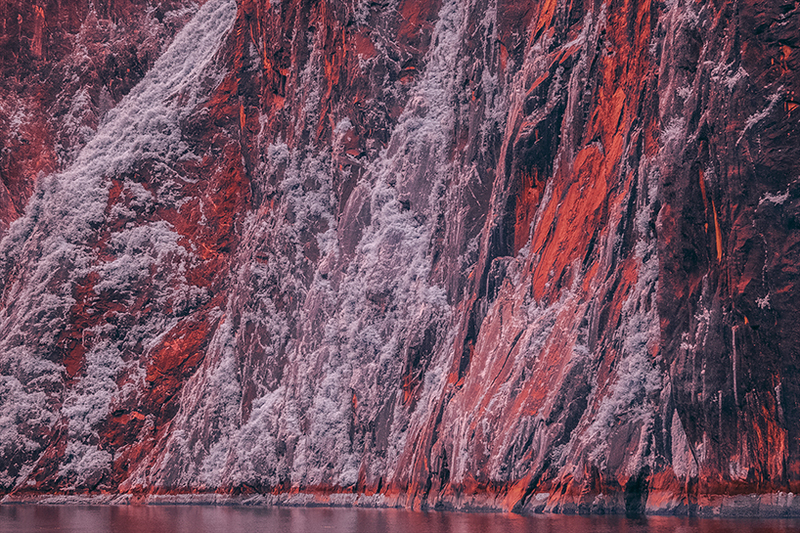 navigating the deep waters in a small vessel, bradley g. munkowitz captures the breathtaking scenery in psychedelic infrared, turning the natural landscape into something more akin to a martian mountain range. 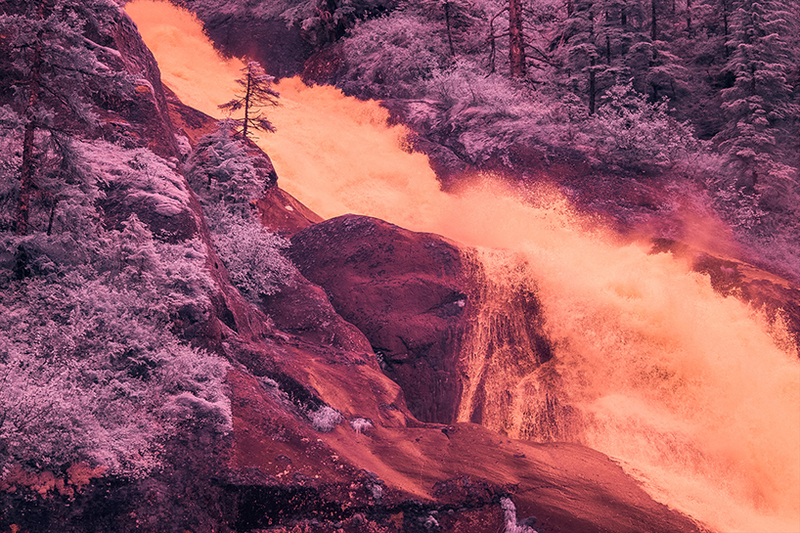 thundering waterfalls, placid shorelines and wooded hilltops are realized in shades of pink, red, purple and orange. rather than distract from the natural beauty of the place, the ethereal new palette serves to highlight both the scenic expanse and small scale intricacies of each photograph. 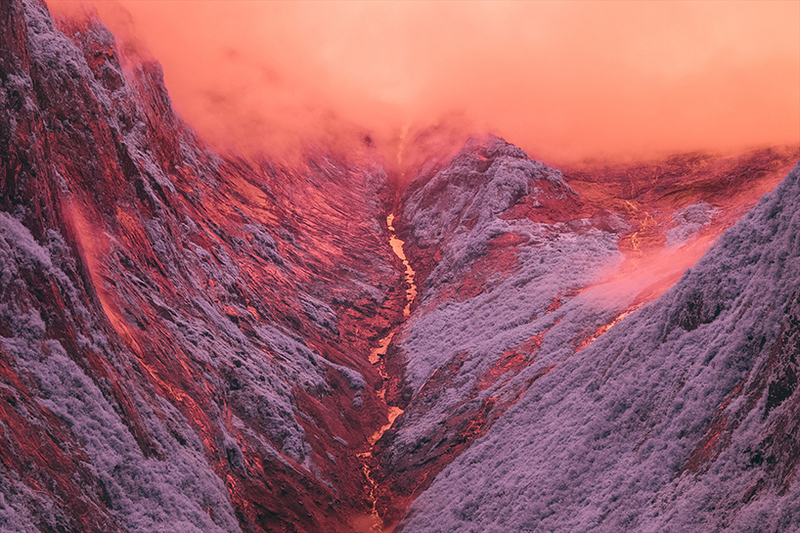 evoking the work of richard mosse, GMUNK’s impression of the isolated ecosystem reorganises our perception of ‘organic’ aesthetics, reinforcing the natural beauty of the area by shifting our perspective just ever so slightly.